Cologne - August 19, 2005 - Above, Benedict sits in chair equal to that of the chief rabbi while awaiting permission to address the audience. Below, he delivers his speech. 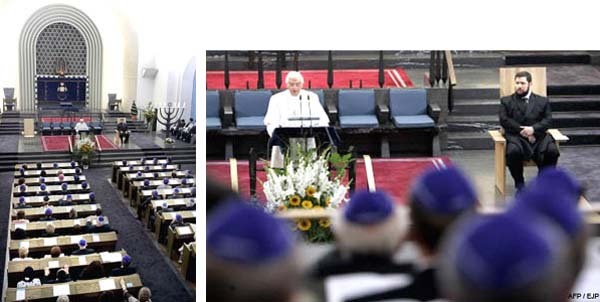 A member of the Jewish audience, Chantal Reich, told the European Jewish Press: "The Pope looked very impressed, even frail and timid, when he entered the synagogue.He gave the feeling of a boy entering into the office of a school director" (online editon, August 19, 2005). Pope Ratiznger initiated his visit participating in a kaddish, a Jewish prayer, and received as a gift a shofar, a ram's horn blown to call the Jews in Jewish worship. It is certainly what the conciliar Popes have done: they have called for Catholics to become like Jews and to transform the Catholic Church into a branch of Judaism. Is the Catholic Church Becoming a Branch of Judaism?